It was the start of a wonderful day for our football club with the team scheduled to tour the town later to show all the supporters the trophy following the previous week's win at Maine Road. "We may have given you some anxious moments towards the end of the season but we feel that we may have given you some pleasure as well. For me it is a proud and happy moment to receive the League Championship Cup on behalf of the club and my special tribute is to the players. "As captain I say a humble 'Thank you'. 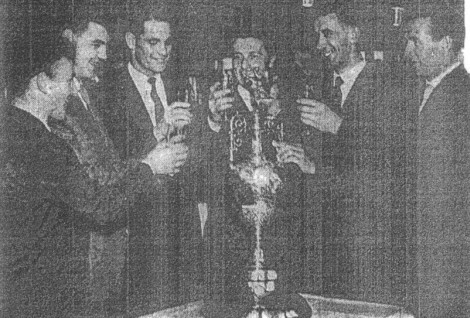 Burnley is a great club and it is a pleasure to be a 'slave' of Burnley FC," so said Jimmy Adamson in the crowning point of a memorable lunchtime at the Keirby Hotel, when Mr J. Richards, president of the Football League, handed over to him the trophy. The table was decorated with claret and blue ribbon, claret and blue flowers and claret and blue menus were passed round to be autographed. 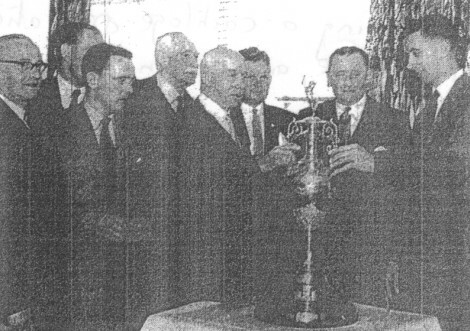 The occasion was the civic luncheon to honour Burnley's selection to represent English football at the international club's tournament in New York. Mr Adamson thanked the chairman (Mr R. W. Lord) and his directors for allowing Mr Potts the manager to get on with his job, and to Mr Potts and the training staff for their help and guidance. "There is a story told of a Burnley trainer, who when asked about his team said, "They are a grand bunch of boys but they can't play football." I hope that Mr Bennion, our trainer, can say that we are both grand lads and can play football," Mr Adamson added. Mr Richards, responding to the toast of The Football League proposed by Mr Potts, said that Burnley were going to New York as worthy champions who would be a credit to their country. He gave them every good wish for their tour and said they would receive a great reception in America. Mr Potts expressed the delight of the club that Mr Richards and Mr Hardaker had favoured them with their presence. The Football League was the hardest and toughest in the world but it provided them with inspiration each week. The FA Cup might have the glamour but the League gave them an interest which remained all season. Welcoming her guests and proposing the toast of Burnley Football Club, the Mayor, Councillor Miss Edith Utley, said that only that morning she had received a letter from the borough's twin-town, Vitry-sur-Seine, congratulating the club on becoming 'champions of England' and in which the Sports Section of the French town said that they had heard of the success and felt great admiration for this wonderful team whose triumph would strengthen the fine friendship between Vitry and Burnley. Burnley's winning of the Championship Cup had helped put the town on the map and the thanks of Burnley people were due to all who had assisted in a fine achievement, said the Mayor. Replying, Mr R. W. Lord said that at long last the football club had been able to achieve a distinction of making Burnley known more widely and had brought honour to the town. Recalling the final match at Manchester which gave Burnley the championship, Mr Lord recalled the captain's part contributed by Jimmy Adamson. "I think that night he played the game of his life and along with the other members of the team was responsible for bringing the Championship Cup here. Jimmy, along with the boys, I salute you."